Yep! You heard that right! 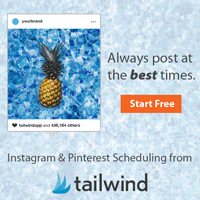 Tailwind just released a new feature where you can automatically post to INSTAGRAM! This is life changing if you depend on Instagram to deliver catered content to your customers and fans on a consistent basis. There have been many “apps” and services that have tried to get this feature for automatic posts. All have failed and fallen short, only being able to offer push notifications to remind you to post. Uhhh goodbye past….hello future! I’m so excited for this new feature. The two BIG players that should be in every blogger’s arsenal are Pinterest and Instagram. Tailwind is already helping bloggers kill it on Pinterest, but the Instagram side of things was lacking…UNTIL NOW. Now that they’re an “Official Instagram Partner” they are one of the first companies able to exclusively use this feature. If you aren’t using tailwind yet, you have to try it out. With my referral link, you can get 1 MONTH OF TAILWIND FOR FREE! With your free month, you can schedule up to 100 pins! This is a game-changing tool that I use and highly recommend to all bloggers and Instagram-ers! Don’t have to manually post each day, thus saving you time by planning once for the month. Will make you more productive because you don’t get lost in your instafeed. No more sitting there trying to think of a great caption for your photo. But!….Can I visually plan my grid, dragging around my squares to create the best flow for my insta feed? CAN I VISUALLY PLAN MY FEED??? Tailwind has a feature called the”9-Grid Preview”. You can preview your Instagram grid to make sure all the scheduled Posts are in the right place and look good next to each other. 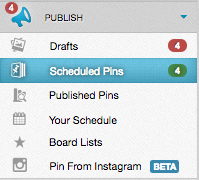 You can easily change the posts into the order that works best for you! You can learn more about planning your Insta Feed from the Tailwind Blog post, ” How to Plan your Instagram Feed to Rock the Grid“. They also have a video tutorial you can watch here. Log in, or sign up for your FREE month HERE. Then go to the Scheduled Posts page (located in the pop-out menu on the left). 2. After you add 7-8 posts and schedule them you can click to toggle the 9-Grid Preview on just above the “Your Schedule” section. 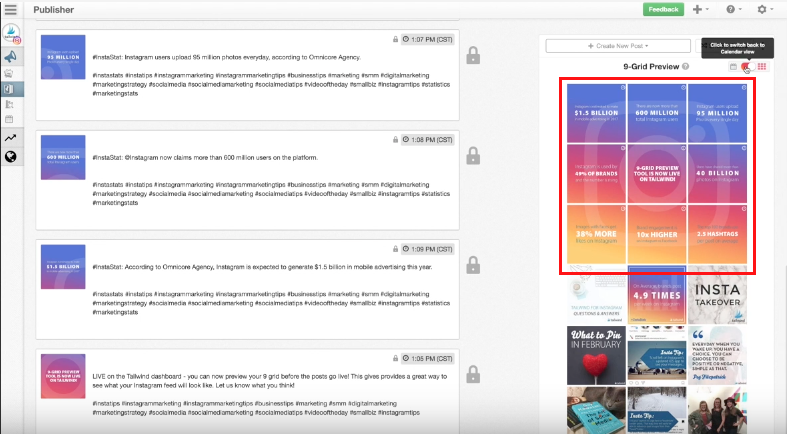 3 – Once the 9-Grid Preview is on, your last 9 posts are shown exactly how they would look on your Insta page! 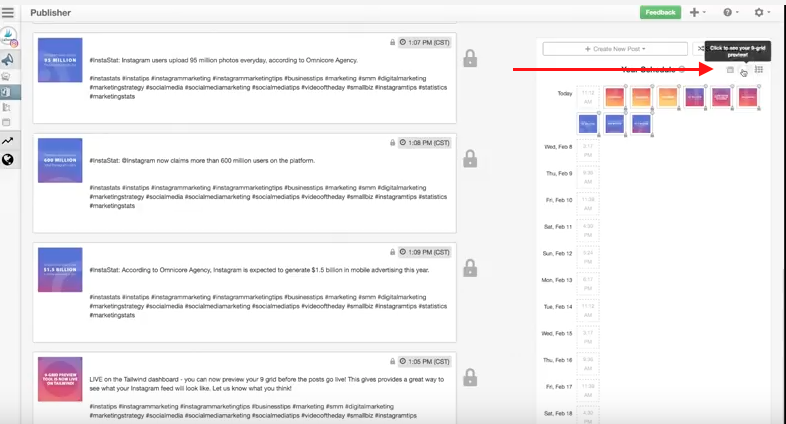 Tailwind’s new autopost feature is GAME CHANGING! If you haven’t tried them out, NOW is the perfect time to give it a go. What do you have to loose when I’m giving you A FREE MONTH OF TAILWIND! Thats plenty of time to decide if the app is for you, and I know you’ll agree it IS! You can sign up for your free month below. ANNND because I’m feeling generous, I have a FREE HASHTAG SWIPE FILE of over 500 Hashtags Popular In 2018 that you can download below!